The following post from the official Sina Weibo of cartoonist Perverted Pepper (变态辣椒) was deleted from Sina Weibo sometime before 3:48pm Hong Kong time yesterday, March 26, 2012. 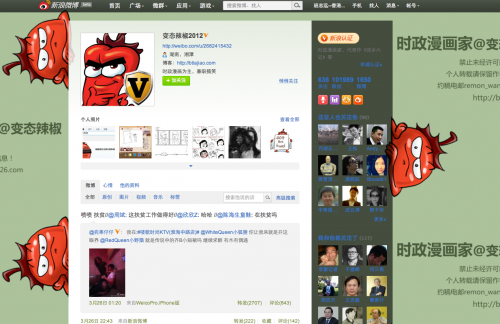 Perverted Pepper currently has just under 102,000 followers, according to numbers from Sina Weibo. [More on deleted posts at the WeiboScope Search, by the Journalism and Media Studies Centre]. The post is a political cartoon in which a throng of ordinary Chinese waves goodbye to a large red ship called “Titanic.” At the helm of the hulking ship stands Chairman Mao, his hand outstretched, and other top Chinese Communist Party leaders. The obvious implication of the cartoon is that the great red ship of the CCP is doomed — and that the Chinese people are ready to send it off to its sinking doom. 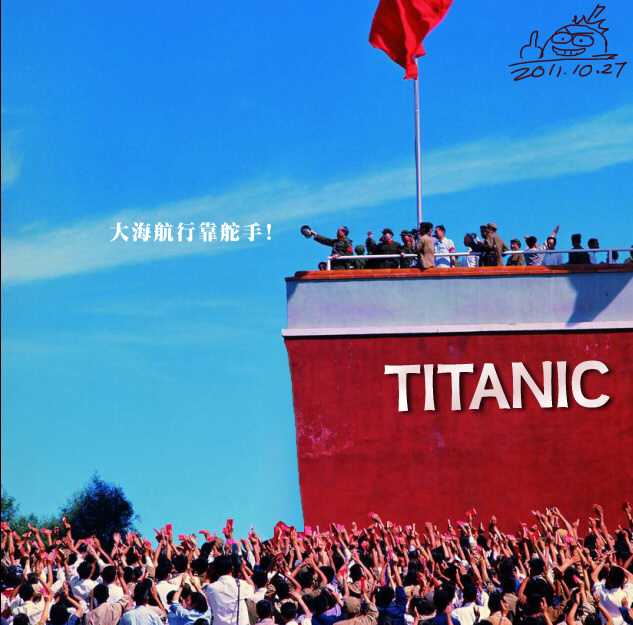 The text in the air to the left of Mao is “Sailing the Seas Depends on the Helmsman” (大海航行靠舵手), the title of a Chinese Communist Party song that was listed No. 1 on a top-ten list of “revolutionary songs” in 1965, on the eve of the Cultural Revolution. [Listen to the song at Youtube]. NOTE: All posts to The Anti-Social List are listed as “permission denied” in the Sina Weibo API, which means they were deleted by Weibo managers, not by users themselves.